Relive the experience through these 20 photos. 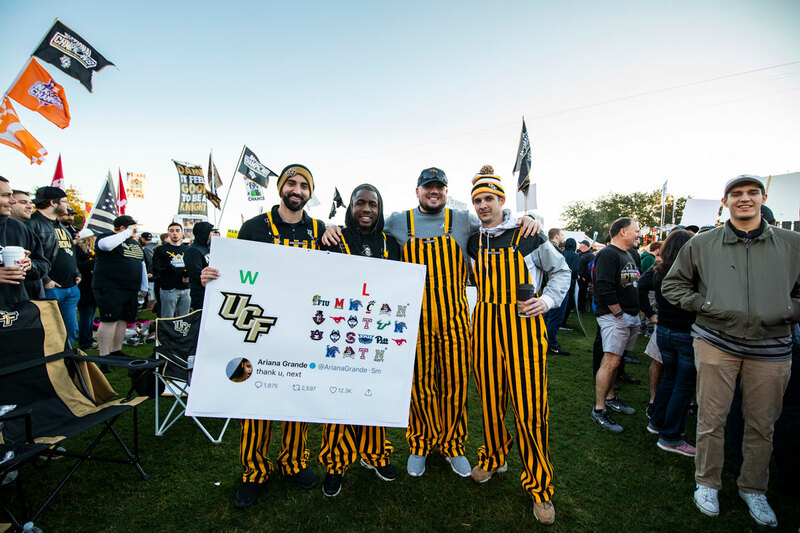 From Thursday afternoon through the football team's big win Saturday night over Cincinnati, campus was electric with ESPN's College GameDay and ABC's visit to UCF. 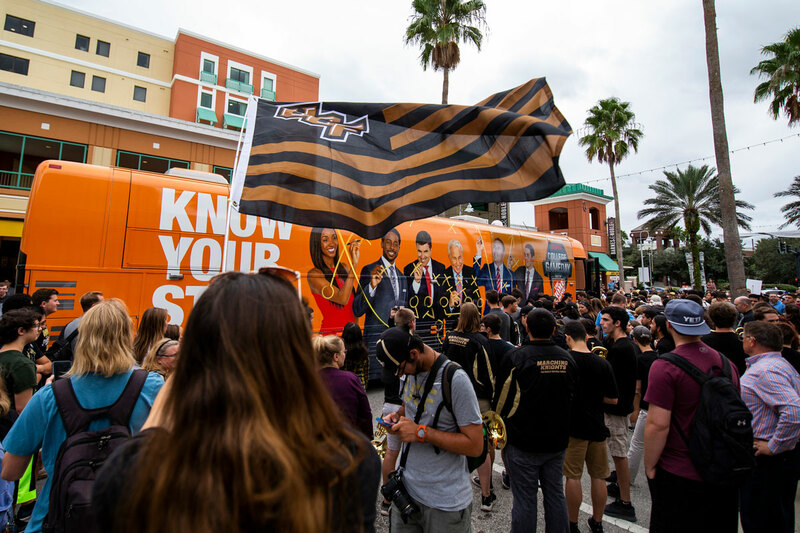 The College GameDay bus was greeted by a mob of fans along with Knightro, the spirit team, the Marching Knights and Knugget on the corner of East Plaza Drive at 2 p.m. Thursday. 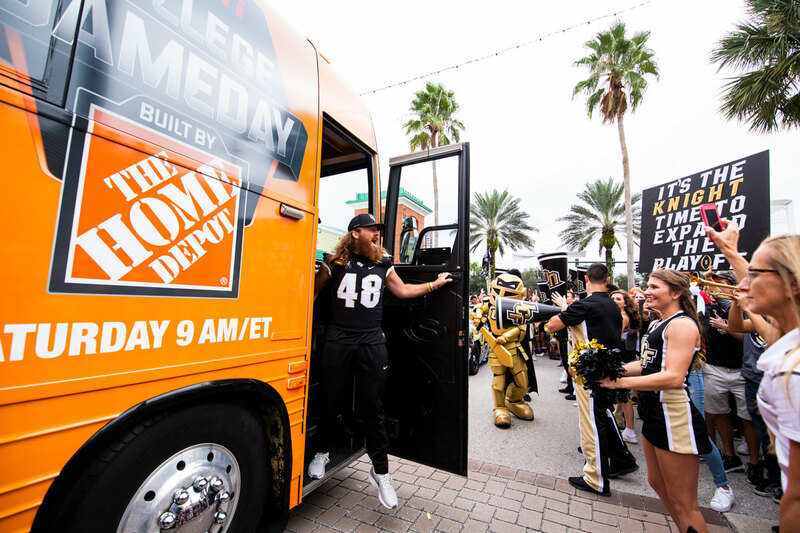 UCF punter Mac Loudermilk surprised everyone as the first to step off the bus. 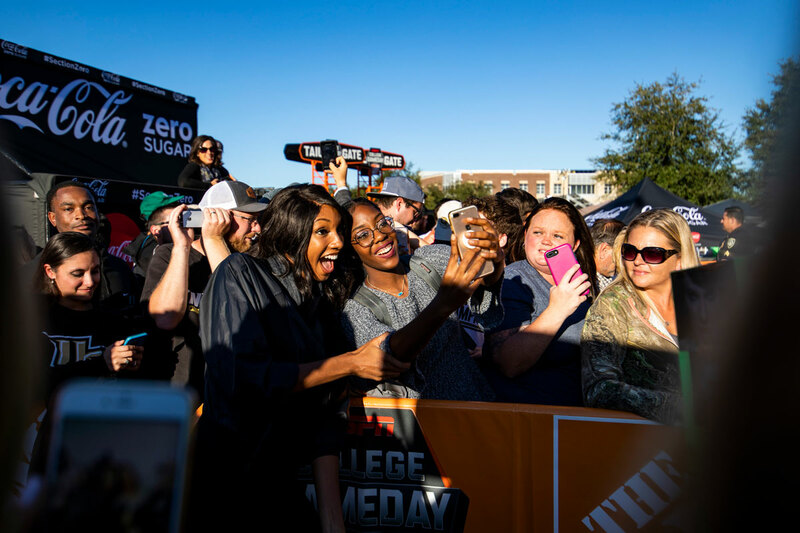 ESPN analyst Maria Taylor stops to pose for a selfie during Friday’s College Football Live broadcast on Memory Mall. “Our Friday College Football Live has never looked so good because fans are just excited to be here,” Taylor says. 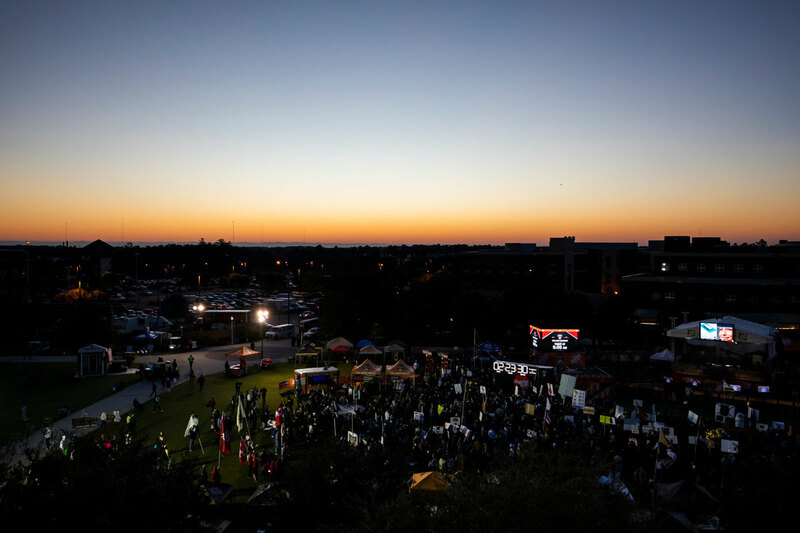 A hoard of fans were already gathered in anticipation of the College GameDay broadcast before Saturday’s sunrise. Some arrived on campus before midnight and bundled up overnight as temperatures dipped into the 40s. 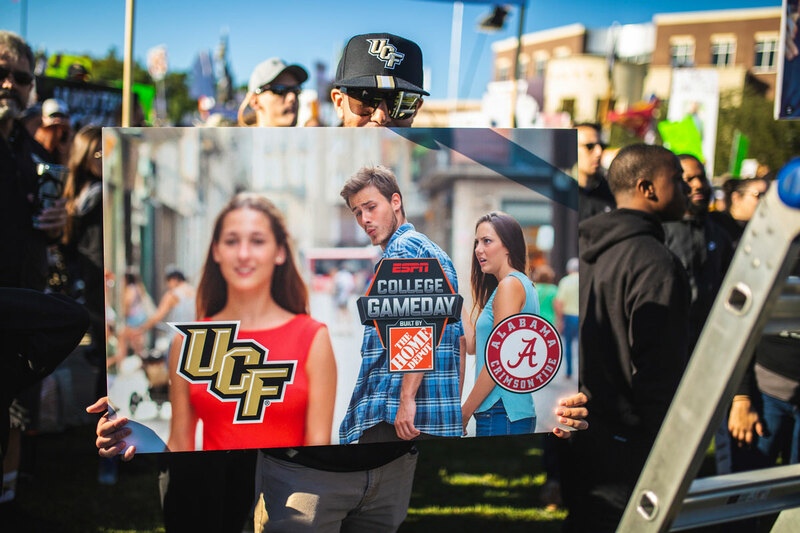 UCF not only had GameDay on campus but a highly anticipated primetime matchup on ABC against nationally ranked Cincinnati. The winner of the game would clinch its spot in the American Athletic Conference Championship game Dec. 1. According to ESPN’s Media Zone, the game ended up as the highest-rated primetime game of the week, delivering a 2.3 overnight. 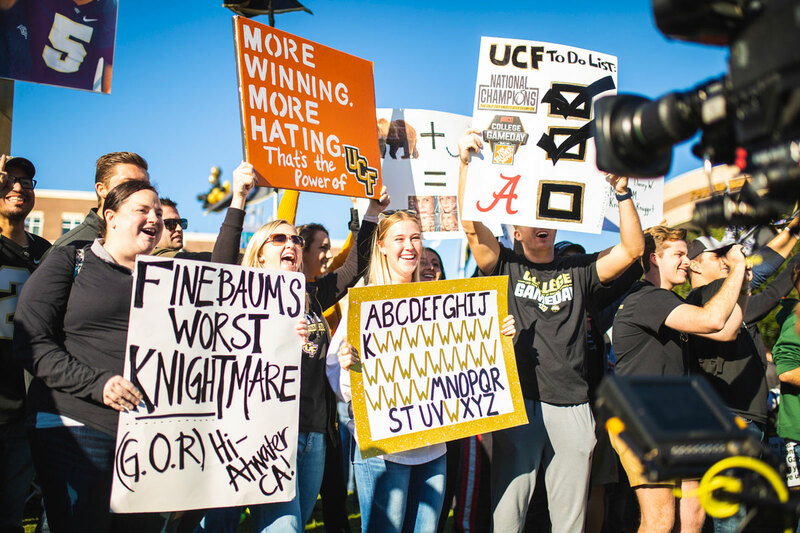 The rating for the Knights’ 23rd consecutive win topped the broadcast competition by 15 percent, leading to ABC/ESPN earning the highest-rated primetime game in the sport for the 10th time in 12 weeks this season. 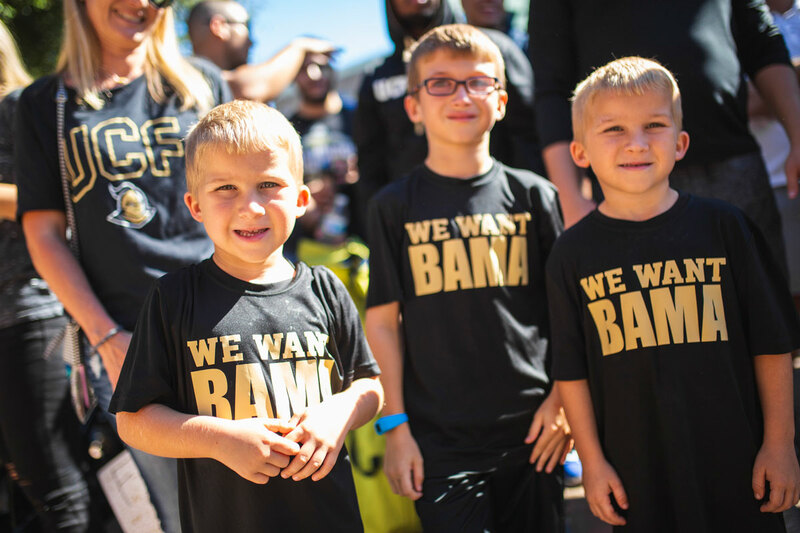 “We’ve been looking for an opportunity to come here because UCF has been a story in college football. … We pride ourselves on not just going to the place where the game might hit the two highest ranked teams, the lowest combination of numbers — we try to go where there’s a great story. 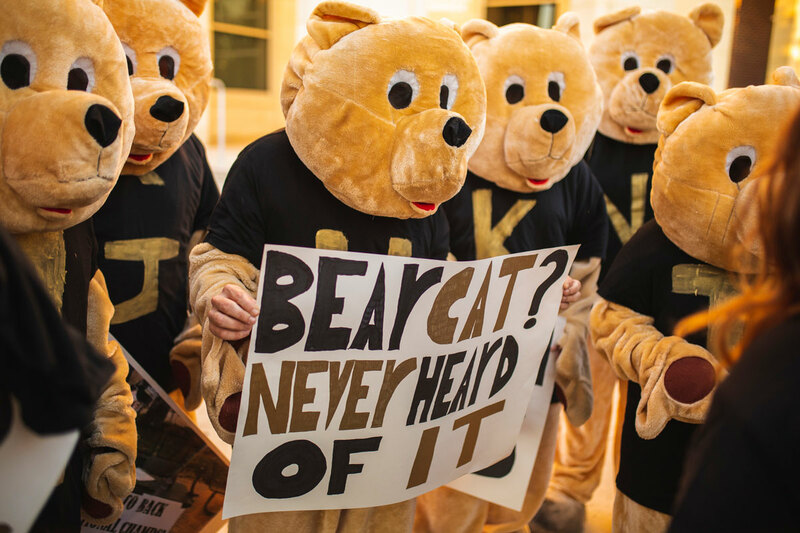 No matter which side of the fence you sit on, I think this is a great story,” says Rece Davis, host of College GameDay. 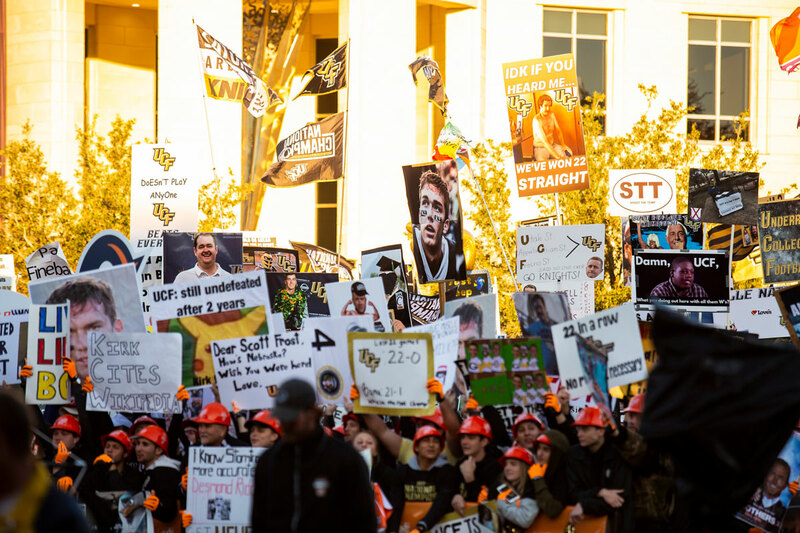 The GameDay analysts commented during the broadcast about the high volume of UCF fans’ signs, saying it might be the most signs they’ve ever seen during their 25 years as a show. 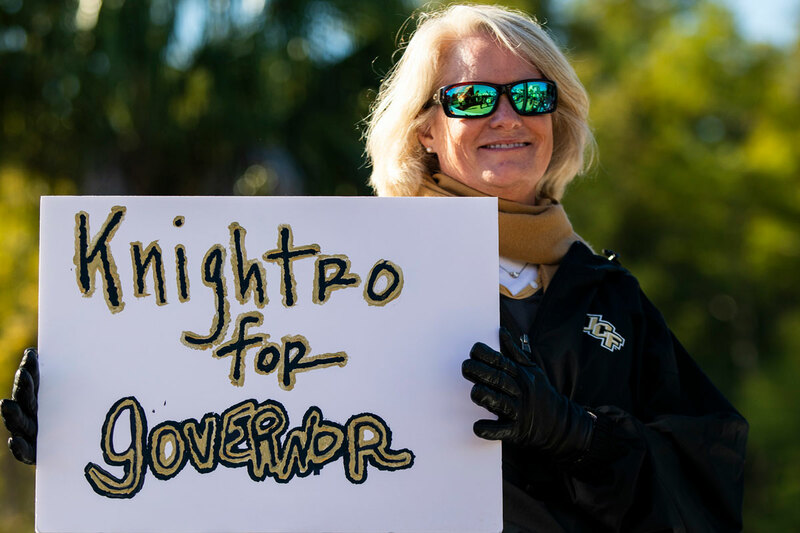 Turns out, a lot of people tuned in to watch Knight Nation on College GameDay. 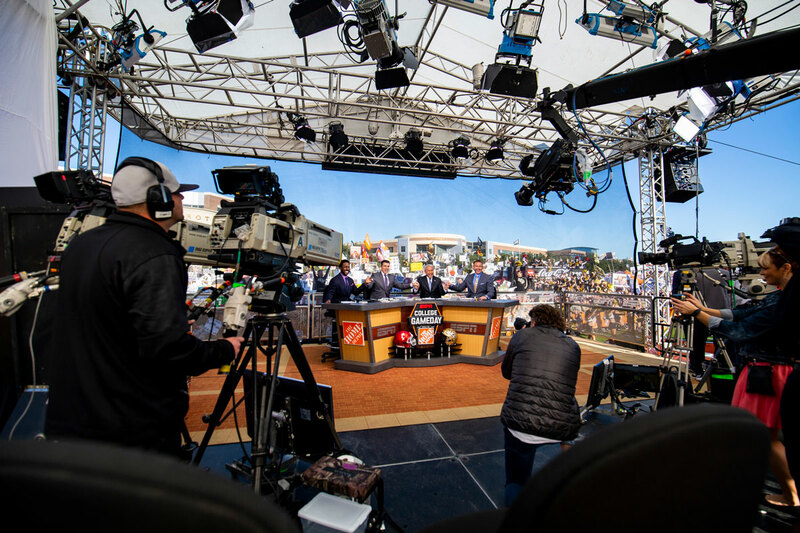 In Orlando, the broadcast earned a 3.9 rating overnight, tying as the market’s best rating for the premier pregame show since 2010. 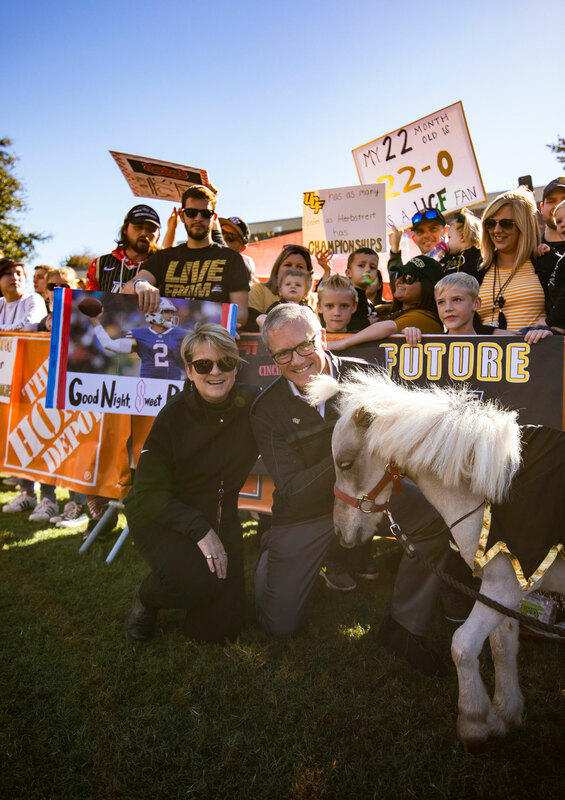 President Dale Whittaker and wife Mary wouldn’t miss their opportunity to pose with fan favorite, Knugget. 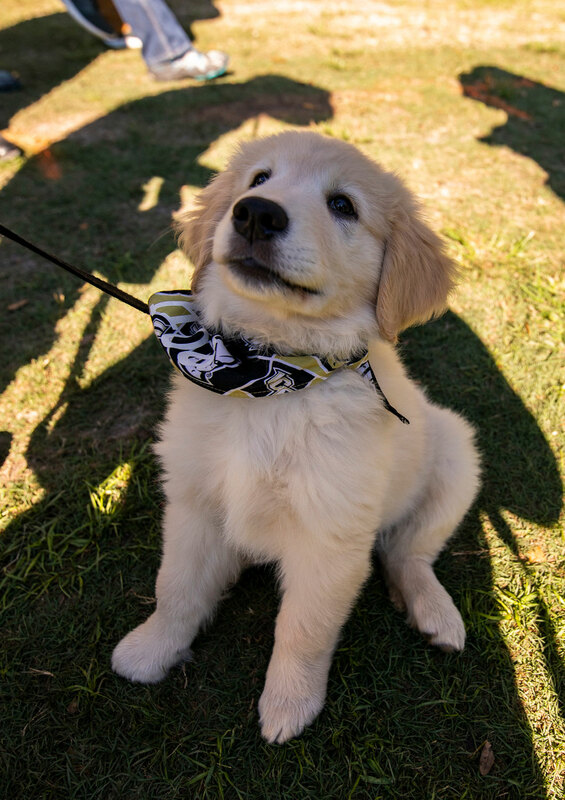 UCF fans come in all shapes, sizes and breeds. Meet Koa. “Waking up in the morning – you dream that as a little kid. 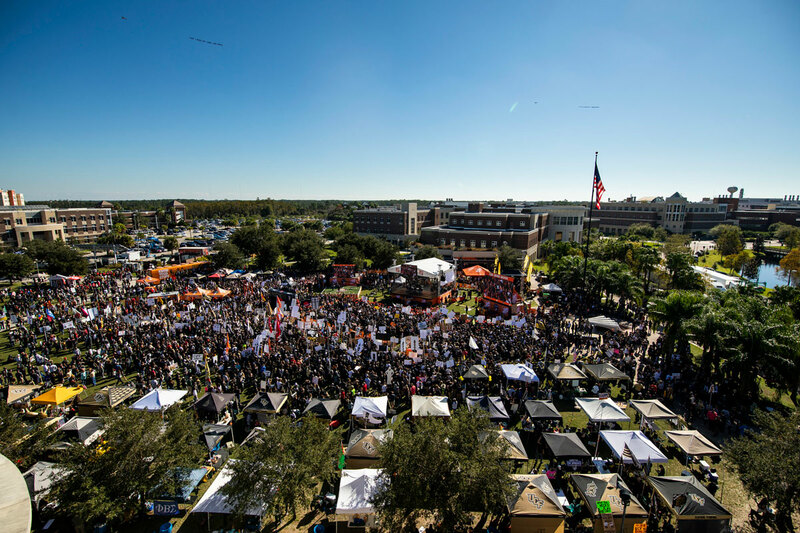 Turning the TV on and seeing it’s in Orlando on UCF’s campus on Memory Mall, that was unreal. This was a childhood dream for me,” senior defensive lineman Joey Connors says. “There’s nothing like being here in my hometown. 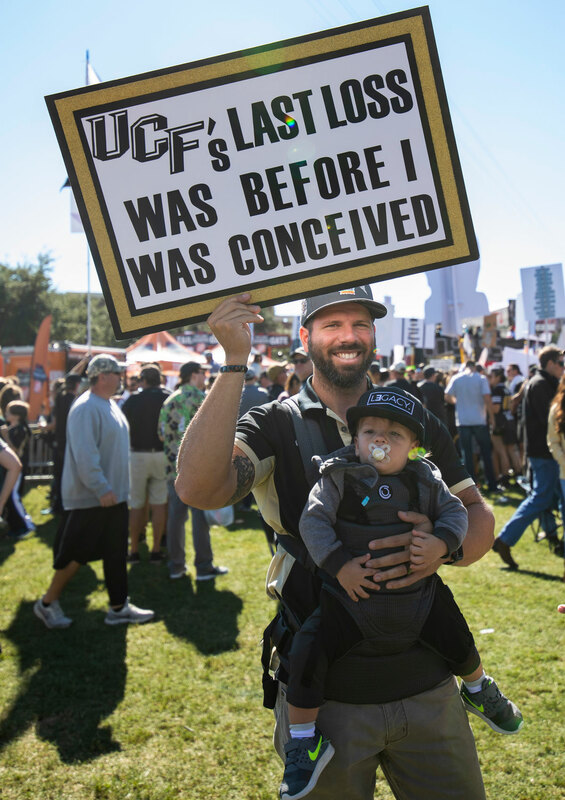 I have a special feeling for UCF — almost like a dream come true. 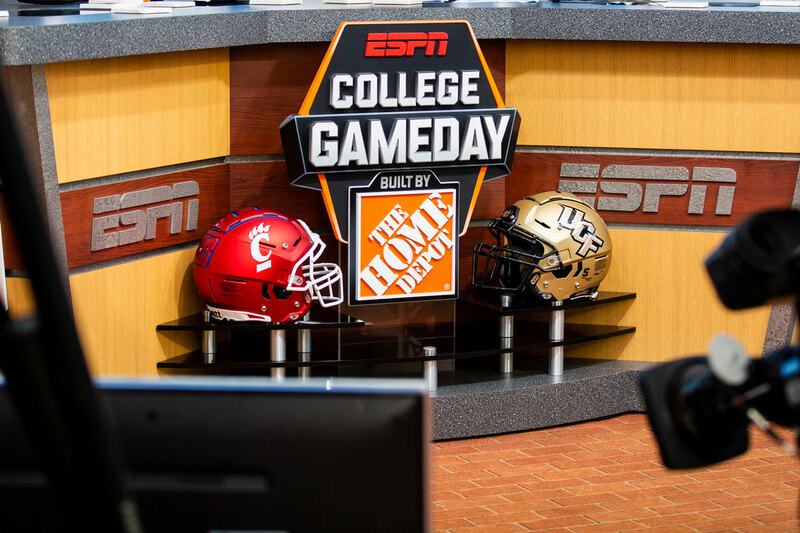 I’ve been doing this for so many years and following UCF, and now to see us bring College GameDay, it’s a great thrill. 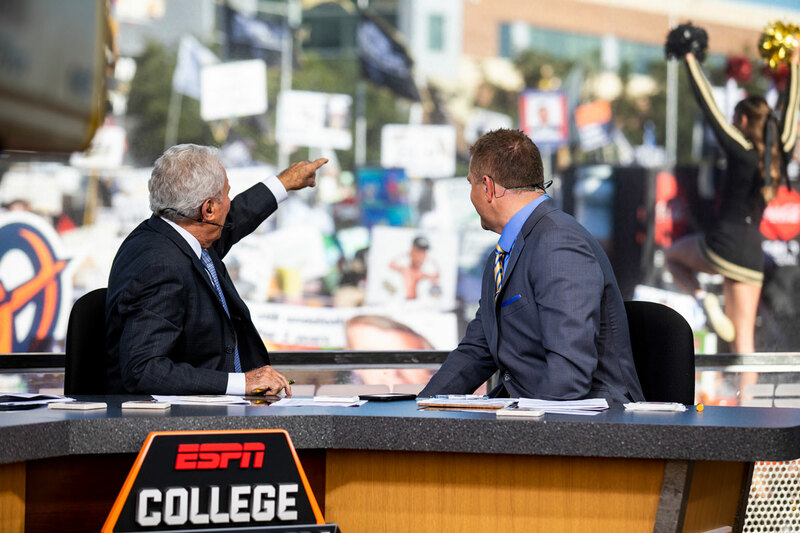 I’ll tell you what, they deserve it,” says Lee Corso, College GameDay analyst and a resident of Lake Mary. 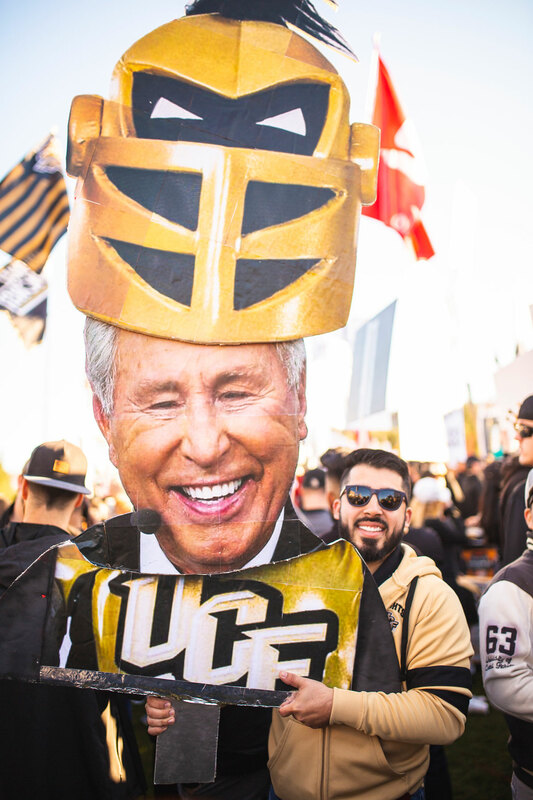 In the closing segment of College GameDay, Corso has become famous for putting on the mascot head of the team he believes will win the game. 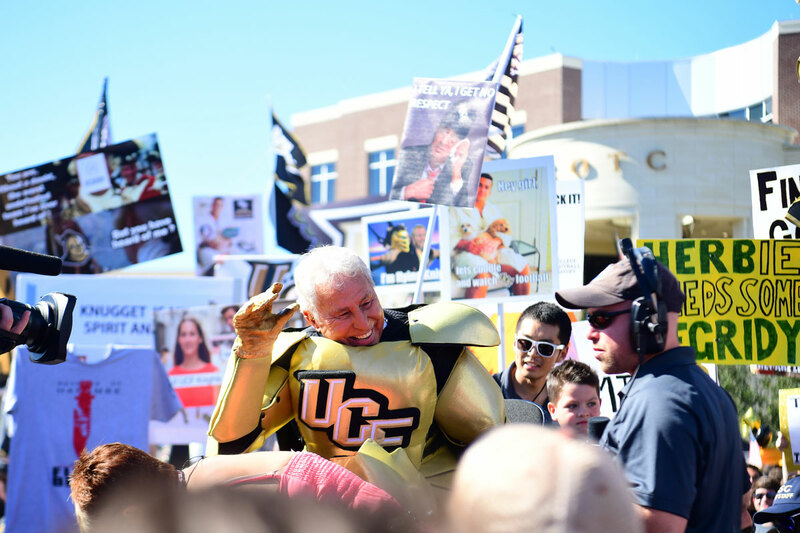 Corso not only put on Knightro’s head — he went all in and geared up in Knightro’s full armor for the big reveal.